Manuel Antonio has something for everyone. With so much to do let us make all the plans and you have all the fun! Manuel Antonio is the perfect introduction to Costa Rica. Spectacular views, activities, tours, restaurants and the local wildlife is everywhere. If you want some adventure you can travel through the palm plantations on an ATV, river raft down the rushing river, or zipline through the canopy. If you want more of a relaxing experience enjoy a massage in your room with our massage therapist who comes to the property. 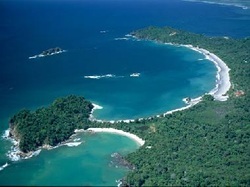 If you prefer the spa experience there are many spas in Manuel Antonio. Yoga is a great way to release any of the stress you want to leave at home. If you would like to practice on the property we do have an instructor that does private lessons or you can join a class over looking the Pacific Ocean. The wildlife is everywhere and you are sure to see monkeys, sloths, and iguanas during your stay at Jungle Creek. The National Park is a must-see where you are almost guaranteed to see it all with a guided tour which is informational and fun. Manuel Antonio and Quepos offer a great variety of nightlife. Listen to live Reggae, Latin, Rock, Oldies or Blues music as you enjoy dinner at one of many restaurants. Dance the night away at the disco or take your luck to the casino. You can go from dusk until dawn if you so desire.